Here's my Nina Scarf. 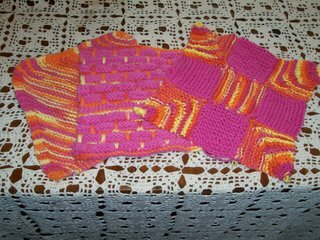 The original pattern was for a shawl, but I just halved the cast on number and made a scarf. It's a Christmas gift for a friend of mine. I've been dying to knit up the kimono but there are no babies in my life at the moment. Then, last week, I found out that the new guy at my job was having a baby. Still, it didn't even dawn on me but when I won the baby pool, a lightbulb went off. I took the money I won, went and bought some achingly soft Blue Sky Cotton and went to town. Of course there's WAY more than I need for the kimono in the two skeins (one's definitely not enough) so a pair of booties were in order. I still have a bit left and may make a hat but I wanted to get this to him asap. Are you just dying?! Makes my womb ache. At Marce's request I have made an attempt at explaining how I'm using the two circulars for this project. In order to save space on this server I have posted these steps replete with with John Maddenesque diagram on my blog. Hope it helps. 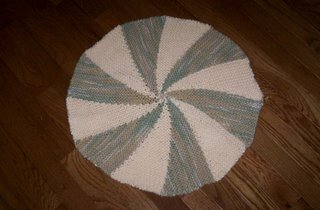 This is the Circle of Fun rug from MDK. I used 2 strands of SnC on 10 1/2's. The short rows are a lot of fun to knit, and it really turns out cool. I used Sugar and Cream Cream doubled for the cream sections and Country Sage Ombre and Jute for the variegated sections. I'm working on the first outer band in Cream. I've knit about 3 1/2 years, so I'm half way there. I may or may not do another outer band. If I do, I'm going to do it just in Jute, double stranded. I'm going to use it in my bathroom. My Abosrba was just too big, and the double stranded SnC is a perfect weight to throw over the side of the tub. Maybe no one has had this problem but me, but I've been (repeatedly) confounded by how fast a dropped stitch unknits itself. So, in case anyone else is having the same trouble, here's what seems to work for me: Stitch markers every 10 stitches (or even 5), and lifelines. The thin is Fleece Artist Handmaiden Seasilk. The thick is Louise Harding Kimono Ribbon. The big honking sticks, I mean, needles are an unknown brand size 17 bamboo circulars. The lifeline is the thickest, brightest colored yarn I had. YYYYEEEEE HHHAAWWW!!!! (yes, we really say that in Kentucky)!!! My daughter just called me and told me that my big ol' order of my Log Cabin yarn came in the morning mail!! Now I want to go home....but I can't...I must stay and work...I must concentrate..I cannot go home and feel the yarn right now....my family needs my income...they need regular meals...and a roof over their heads...I will keep repeating this to myself..
My three daughters returned to college last week, each taking with them a warshrag knitted with the colors of their choosing. Details on my blog. Here is my completed Kimono. Many thanks to all of you who gave me pointers on making a better kimono the first time around. I crochetted a ribbon tie on the inside so the kimono flaps wouldn't shift around (thank you for the warning, dana kbs!). 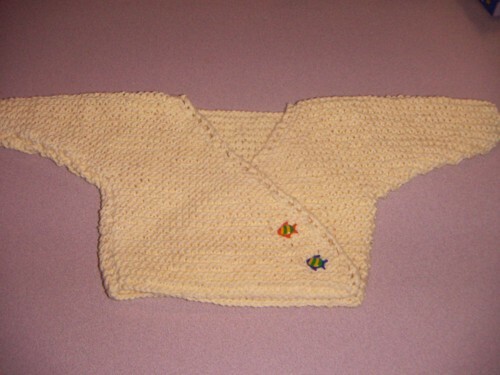 The yarn used was Idena Bambino Bomull. It's the softest 100% cotton I have ever worked with. It's also machine washable...I will definitely add more of this stuff to my stash. I also made the baby a Victorian Baby Jacket and Petal Bib. Details at my blog. Here are the latest additions to my gift box. Car knitting makes these bibs fly by for me, but then the finish work, to be done at home, takes forever for me to get around to doing. The sun bib has the cutest flip flop button. You can see more details on my blog. Specs: TLC Cotton Plus, knit to pattern except I shortened the bottom intarsia block as it was getting a little long. Single crochet edging. Hopefully I'll have another one to show you soon, in pink and purple! Question for you---what size needles have you used with this yarn for the hand towels?? I'm wondering if I should get a 2nd ball & just double strand it??? I'm so loving this (best ever TV watching) project... can't wait for DH to hit the hay so I can watch movies and knit. I'm having so much fun just freewheeling it, changing colors when the mood strikes me or I just get tired of the color plum. 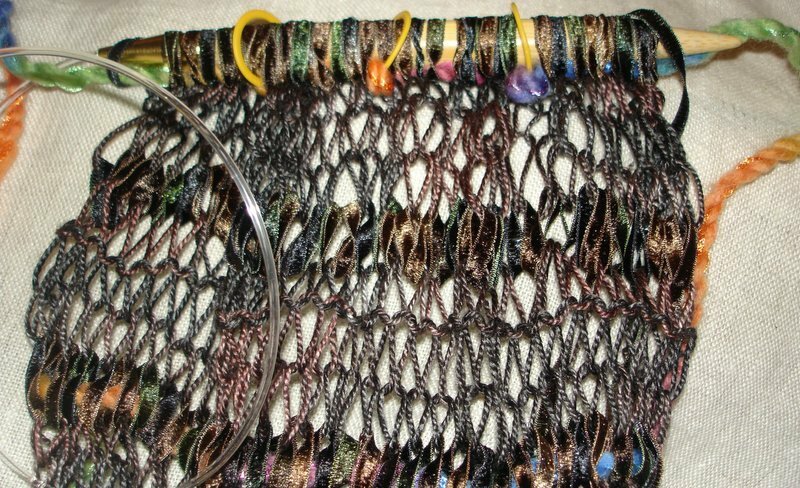 I've been knitting on two circulars, leaving one with the stitches "live" and just picking those up as I pick up the few garter ridges of the neighboring color. I forget who mentioned this earlier in the KAL..but thanks! I've also been weaving in ends as I go....I know I'll be pleased with this effort in the end. I'm thinking that I need to start on some linen hand towels for a shower gift soon. I tend to knit pretty loosely so I plan on using size 4 needles as I've seen recommended here. Y'all are such a great resource! I also know how obsessed everyone is with this KAL and I'm going to time how quickly someone responds to the following query. I'm at the office and plan to cast on a bib during my lunch for yet another kind of shower. My books at home though...how many stitches do I need to cast on. Okay....what is this about not binding off the stitches on the log cabin and holding them on another needle?? How do we do this? Is there a diagram? Is there a step by step??? Oh my gosh, I am going into newbie spasms here!!! Thanks to all who answered my question earlier. I am picking up too many stitches in the rows. Also, where do you put the 10th strip? 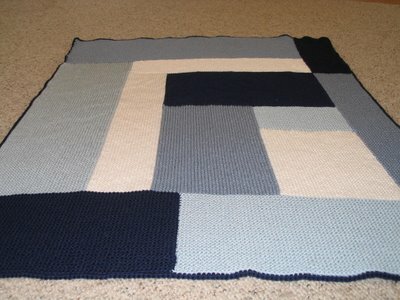 I have the center square and two strips on each side - that comes up to 9 strips. Adding a 10th strip goes against my "Monk-ish" ways of liking symmetry. Where is it supposed to go? All the way around the mat? LOG CABIN ridges or not???? 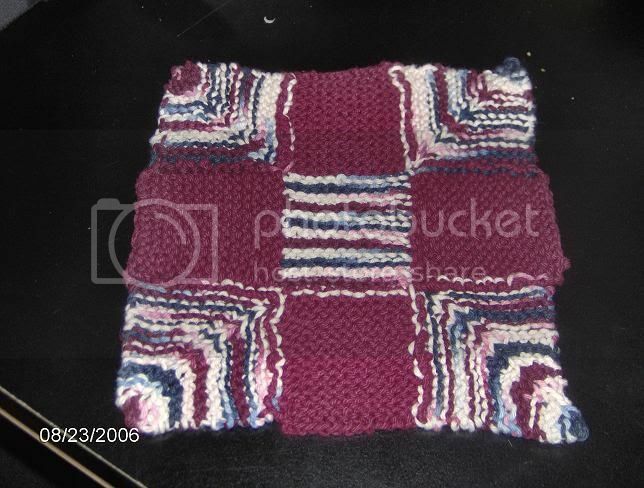 Is there anyone willing to postor email me at angela.c(at)mchsi(dot) com the back side of their log cabin blanket so I can see how they are supposed to look?? I am working on one and every side of log that I pick up stitches on has a big ridge bump.Is it supposed to be like that if not how do I prevent it. 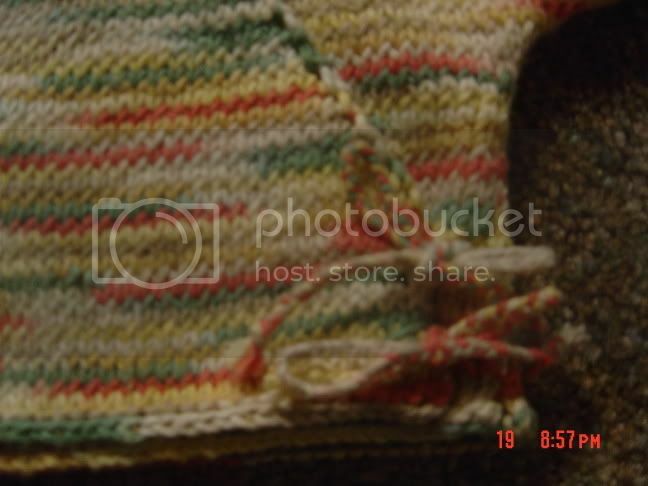 Also can someone send me the web page that someonehad showing how to keep the stitches live instead of BO each edge. Has anyone added a magnetic closure to the button hole bag?? I've had quite a few requests to add them, but how do I hide the hardware? or does anyone have a source for sew on magnetic closures? 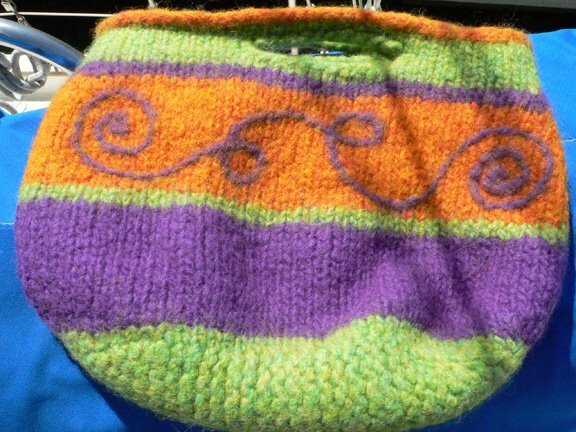 Any help would be appreciated...I have to make 5 purses within the next 2 weeks. Hey Ladies (and Gents) . . . . . I'm knitting a ballband washrag right now, but that isnt what my question is about. I would like to know if you can use LB Microspun for the One Piece Baby Kimono, and if I could use the same size needles or would I need to drastically change the needle size?? Also would Circular needles be better for this (I know it's knit flat)then straight needles?? The reason I ask this without just checking guage myself is that I dont have long enough needles, I have mostly dpns and if I could get a head start on size diffrences then I could order what I needed. I know that checking the guage is the only way to really know if the microspun will work. Thank you for your help. I'm 9 strips into my absorba and find that the mat is not rectangular, but comes in at the middle. Is this because I'm picking up too many stitches at the end of the rows? 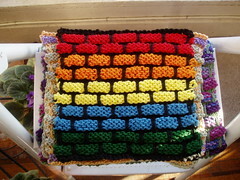 I'm picking up a stitch for every row. 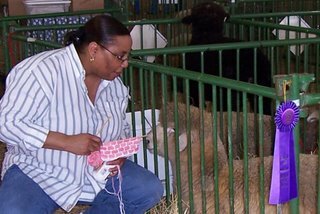 I now remember that a good rule of thumb for picking up stitches along the row side is to pick up 3 stitches for every 4 rows. For those of you who've knitted this (or have done any log cabin knitting) is this a common problem? 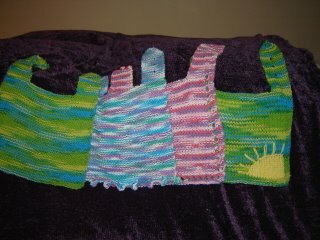 I am busily knitting the ballband warshrags (love those things! 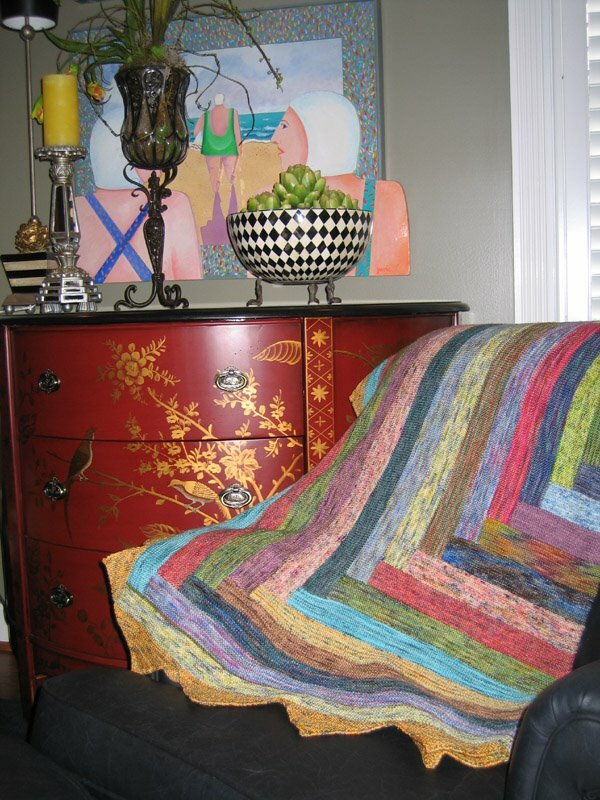 ), but I just ordered my yarn for my first Log Cabin blanket. I ordered Elann Sonata mercenized yarn. 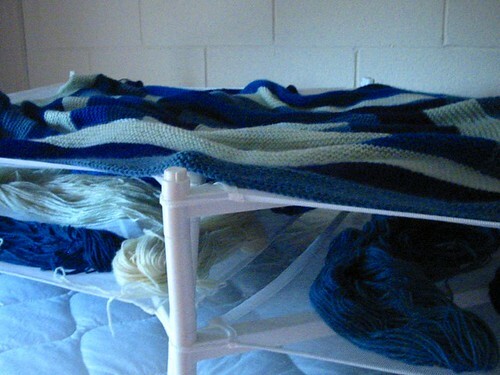 Any tips and/or advice from you 'sperienced knitters who have already braved the blanket? 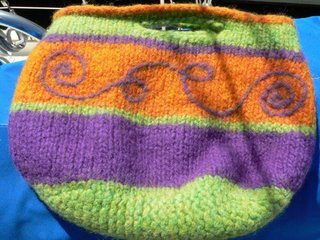 I went to the Michigan Fiber Festival last weekend in Allegan. It was lots of fun. There were lots of animals (llamas, alpacas, sheep, rabbits, and goats). They also have vendors selling anything and everything fiber from roving to spinning wheels, to books, to yarn. 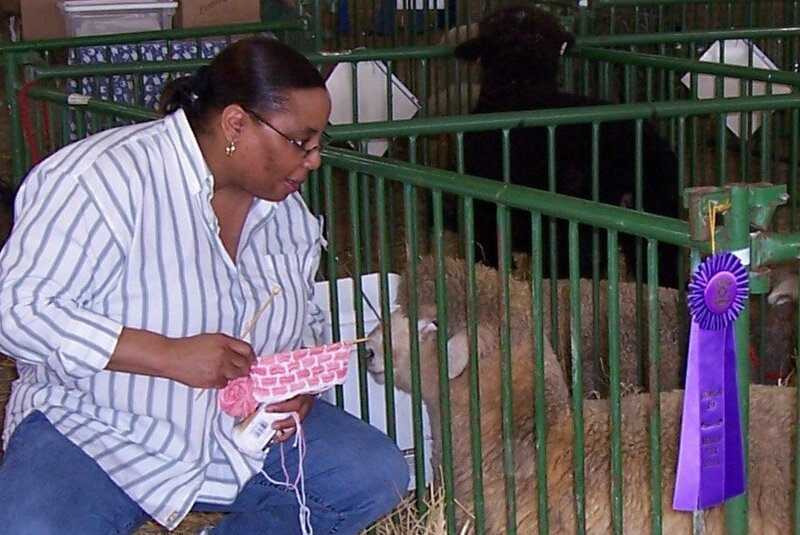 I tried to interest a sheep in knitting a ballband warshrag but it didn't work. I'm so excited to publish my first post! I won my signed MDK from a LYS. I was so excited to win it! I love the amazing projects it contains. 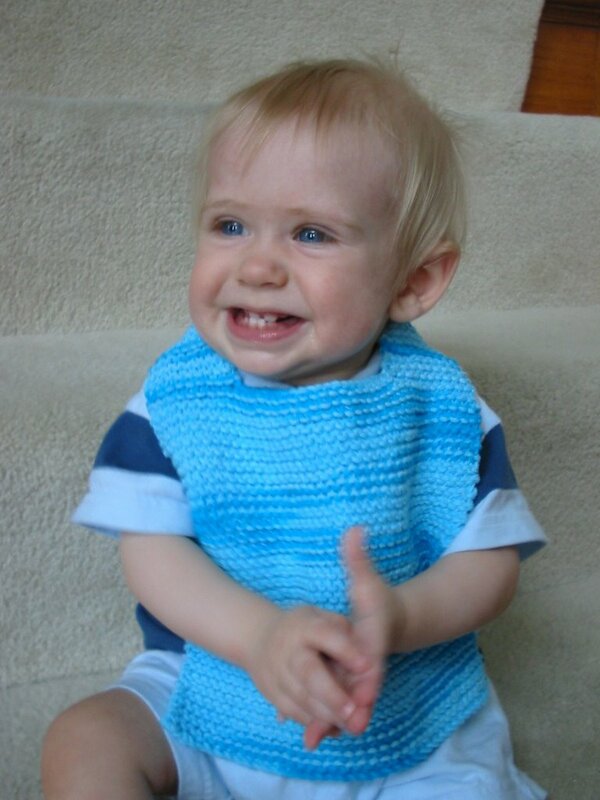 My first project was a bib for my son. I enjoyed making it so much, I made 2 more. The one modeled here by my son was made with Sugar & Cream. 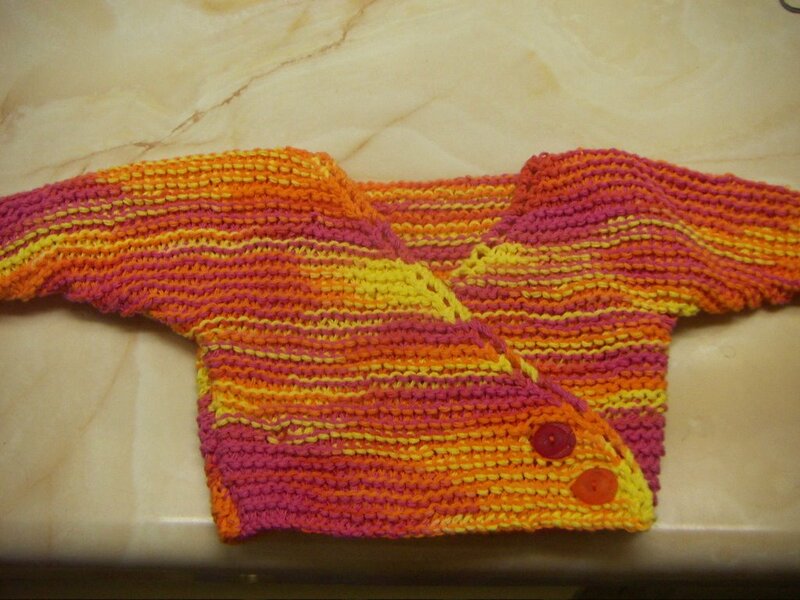 For the other 2 , I used Cottontots and Tweedy Cotton Classic. We love them! 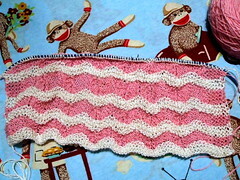 My next projects will be ballbands and towels for my daughter who is getting married, and an Absorba for my bathroom. There are two things I like about this pattern and make it so addicting. First is that you can play with color (and I love color) and each one comes out looking different. Second is I love using them and want more for my kitchen. 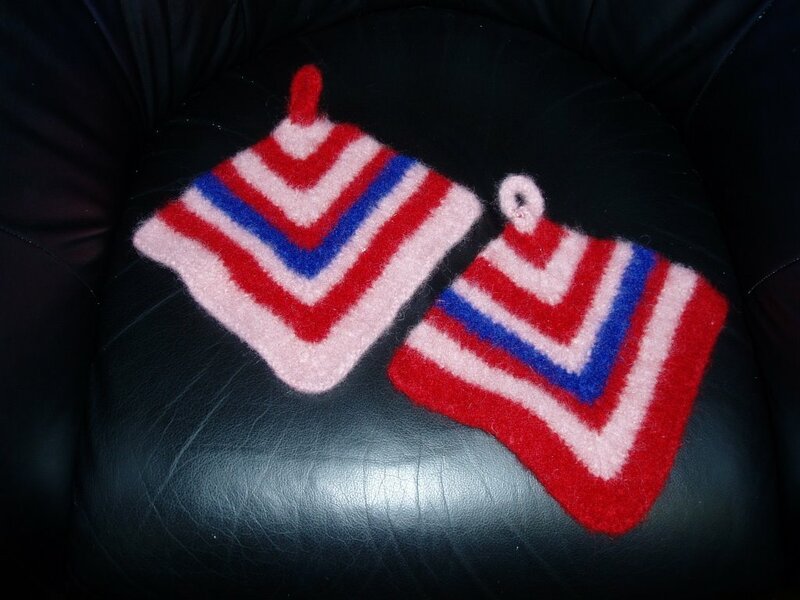 So I decided to keep the second one I make and the one on the needles is now for my Mason Dixon Swapcloth pal. 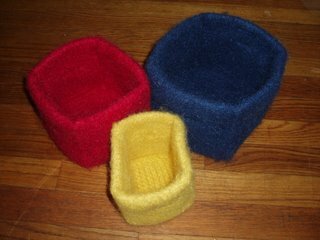 This is the largest size of felted boxes. I know the directions said to felt all of them at the same time, but I just couldn't help myself. It was almost midnight and I was playing with the washing machine last night. Changed only one thing from the original pattern, only putting in two handles. I figure I only have two hands and didn't require the extra handles. It will make a lovely teachers' gift this Christmas. Now what to fill it with? I finally made some ballbands for myself. The first one didn't come out how I had hoped, but the second one is exactly what I wanted. I love how bright it is, it will look great in my kitchen. 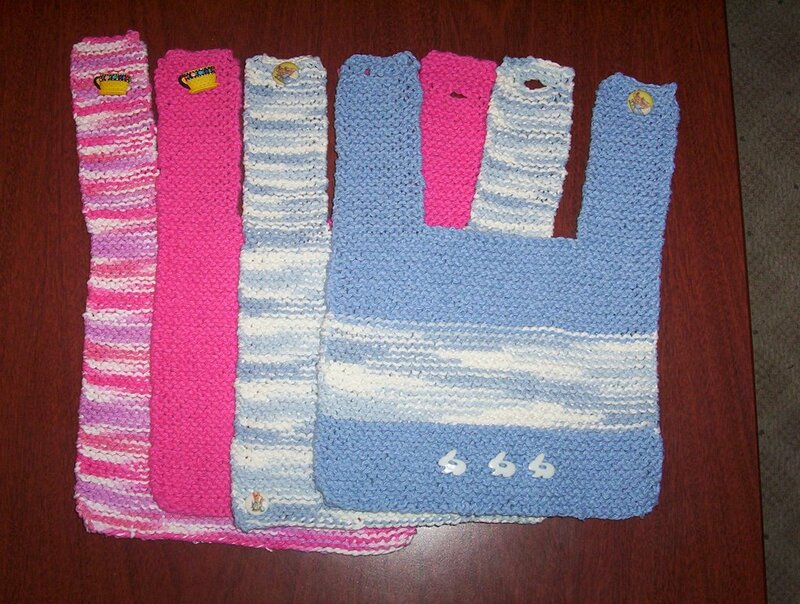 Holy cow are these quick (and easy) to knit! I managed to get both done this week. 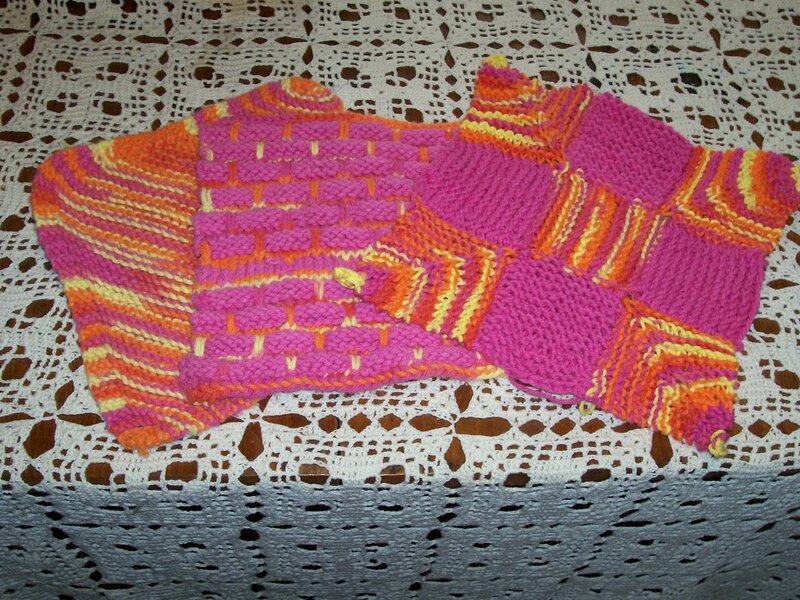 The top one is done with Bernat handicrafter yarn in "Playtime" & has pink & orange fish buttons. 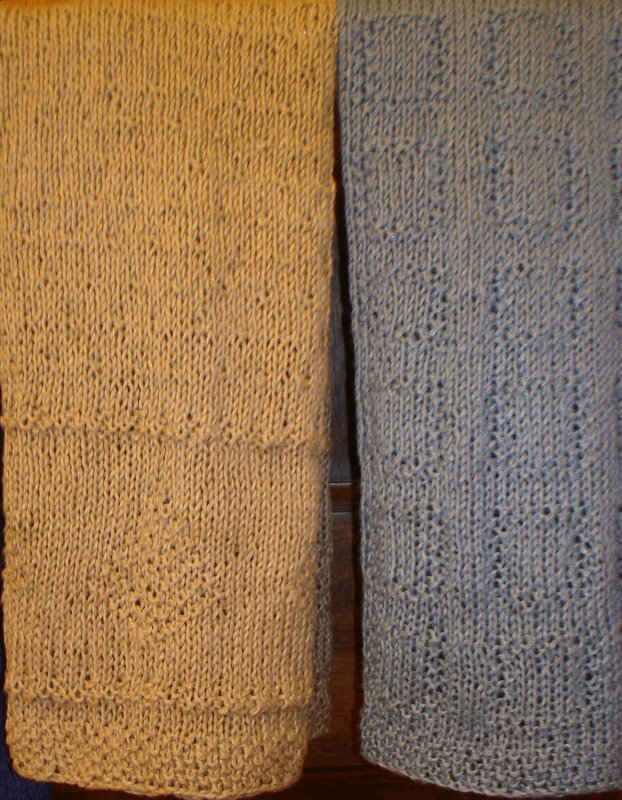 The bottom one was done with yarn from AC Moore's mill ends bin! A pound of yarn for $5. It's the same quality as S & C & worked up beautifully! It also has fish buttons! I'm interested in making a smaller version of the ball band. Has anyone who's done that have advice about how many to cast on? And what size cloth did you end up with? Thanks for any help! I Hate the Runaway Bride but I love knitting. I finished a moss grid towel-this is pre blocking-I used #4 clover bamboo needles and Louet Sales Euroflax in Willow. 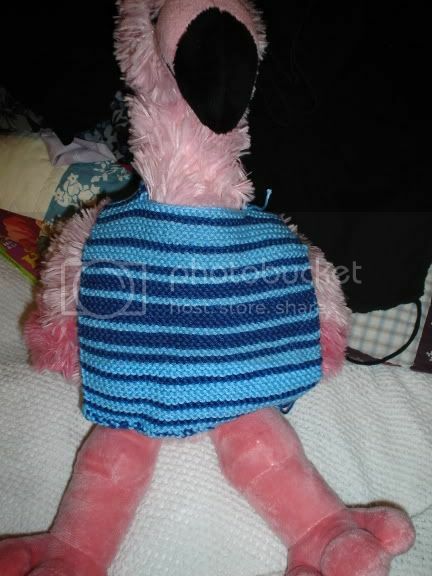 I loved knitting this up! I started on #5's but I thought it was a bit too loose. I love how it knitted up on #4's. 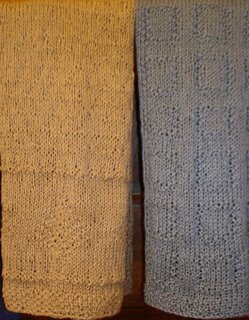 I have another hank to knit so I can display the pair in my powder room. Will it ever be prissed up! 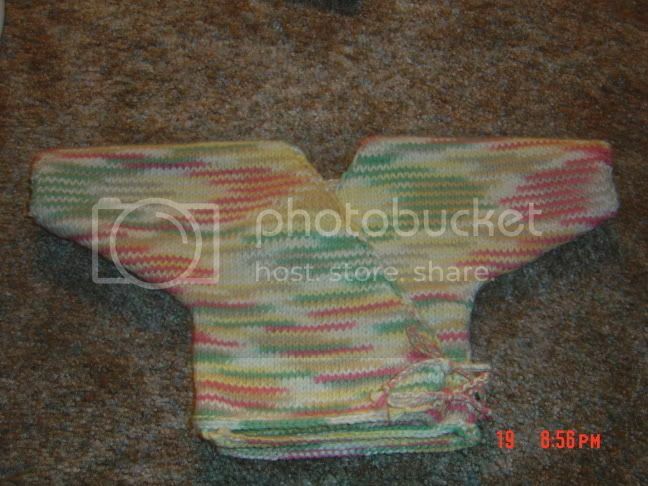 I was wondering if anyone can look up the amount of SnC needed for the Heartbreakingly Cute Kimono pattern. I'm at work and don't have my MDK book here. I'd like to stop and get the yarn on the way home. I just finished my first round Warshrag last night. It was coming along swimmingly until the last 4 rows. When the pattern reads (ssk, K1, psso), where in the heck do you get the slipped stitch to psso? Mine came out OK, but with gaps. I finished my first project - a lovely ball band warshcloth - okay....it does have a couple of mistakes - but I learned a lot from doing this first project. And it used two colors and it wasn't a scarf or a hat!!!! I will figure out how to post a picture soon! Help with "Scribbling" and yardage? We bought some yarn to make a few of the scarves in the "Scribbling" section of the book. But. Trying to figure out what we really need (yardage) for our substitution(s). It says just use "a Thick" and "a Thin". I am hoping someone who has made any of these can help me make sure we have enough of each. For the yarns we want to use, we have a ball of 33 yds. "thick" with a ball of 90 yds. of the "thin". In another combination the thick is 98 yards, and the thin is 90 yards. (?) In the book, the Thick is 83 yds. and the Thin is 350 yds. Was there LOTS of "THIN" left, or does it take that much really, and that little of the Thick????? Thanks for any help, we had our "heart set" on some colors and yarns and we want to try to get any additional while it is in stock at our LYS. :) Thank you, thank you. I finished my Tree of Life towel! The rest of my Mason-Dixon Knitting story is on my brand! new! blog! Has anyone made the Bubbly Curtain? Hello, all. I think I'm ready to start on a custom Bubbly Curtain for my back door. I think the window is about 2.5 ft wide and 5 or 6 feet long. Yeah, I know, I'm setting myself up for monotony. But as A&K would say, no project is too ambitious if you crave the result enough. Has anyone made a Bubbly Curtain for a window that big? Was it saggy even after starching? I may decide to make a Target run and save the bubbly pattern for a smaller window. 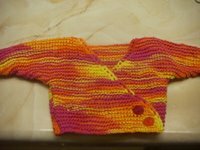 I love the bibs - this one is made from KnitPicks ShineSport on size 5's which makes it a little finer - I haven't washed it yet to see how it withstands the landry cycle but I'm thinking it will be fine. Also, today is my birthday & I have a little contest going at my blog - www.katerzers.blogspot.com for some KnitPicks Sierra in a Green, Blue & Black - these would make some great felted boxes. I've had to abandon my baby blanket for a baby shower this weekend and decided to whip out some of the baby bibs and burp cloth. My question is in the pattern after you knit the 64 rows, what does CO 20 mean? Is that cast on? I will post photos of my finished ballband warshcloths, the Absorbia that still on the needles but LOVE it! and the bibs soon. At last I have wrestled the Sugar N'Creme yarn into submission! Hi! Just signed up! MDK is such a great book. 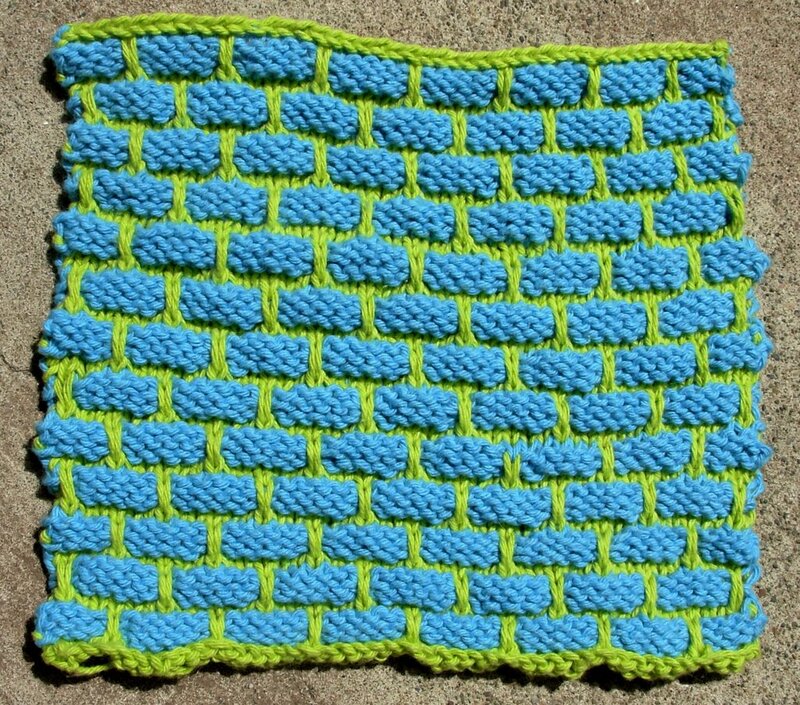 So far I've done one dishcloth, thought I'd share it! I love this pattern! I have just been added - I am so excited! I received my book last Saturday and am in the middle of my first ball band warshrag. All I want is to sit and knit a projects. I have finished and gifted my first Mason-Dixon kimono. In honor of the occasion, I have written the following song which is to be sung to the tune of “My Sharona”. Ooh my little pretty yarn, pretty yarn. When you gonna be done, kimono? Ooh you make my fingers cramp, fingers cramp. Final stitch comin’ off the needles, kimono. Never gonna stop, knitting rocks. Special thanks to the supreme creativeness of Elizabeth. As you can see, I not only went with your button instead of ribbon idea but also the puppy button idea, too. So. I got carried away and bought some Nashua Creative Focus cotton, which is mercerized. A buncha it. As I looked at the happy colors all nestled together, I thought, ohmigosh, a log cabin! My question for all you more creative and experienced kuh-nitters is, would this yarn work for the log cabin? It doesn't seem to have a lot of "heft" for lack of a better word. Woo hoo! My first post! 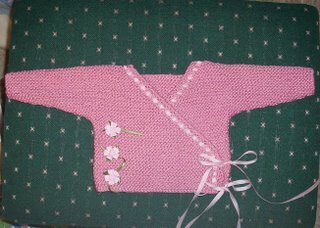 I recently did the kimono as a baby shower gift. I used Peaches and Cream in Peppercorn Ombre. 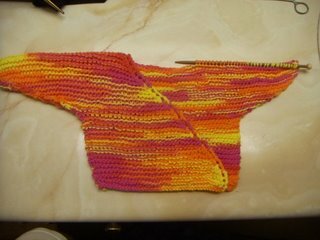 I did a garter stitch border along the edges and at the cuffs. It doesn't line up quite right but it still gets the job done. 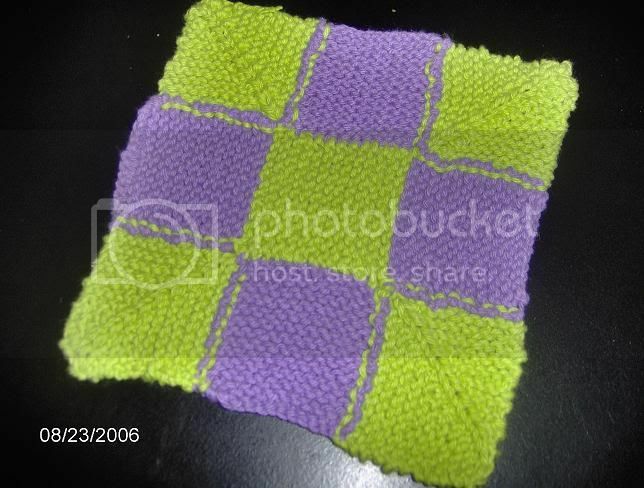 :) This was my first time seaming with the mattress stitch. It was fabulous! Here is the whole thing. Sorry for the less than stellar quality. This is a close up of the ties. I just did braided ties that I stuck through a stitch and sewed into the back side of the top. And this one is of the arm detail. Hard to see but it's there. 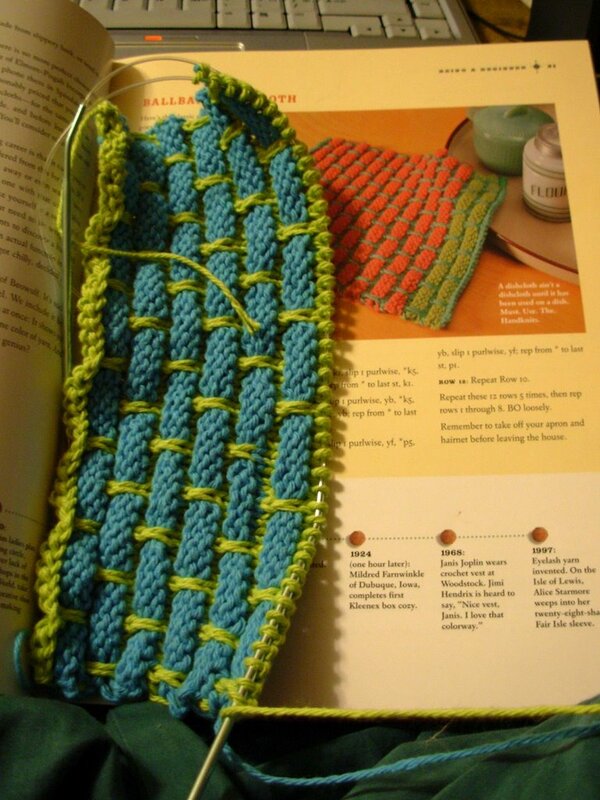 :) I just did two knit stitches at the cuff. 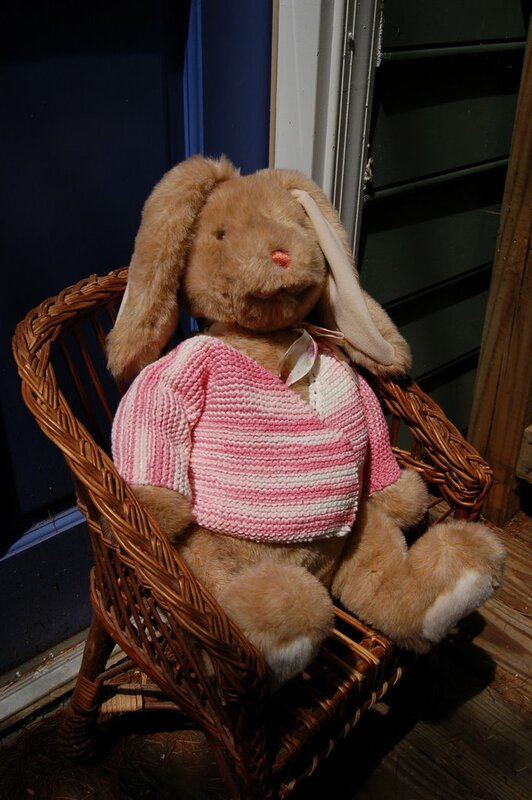 The whole thing is in stockinette. I LOVED this pattern! I've been asked by a few other people for one so you'll see more pics soon! Just one more Nine Patch/ mitered corner question! 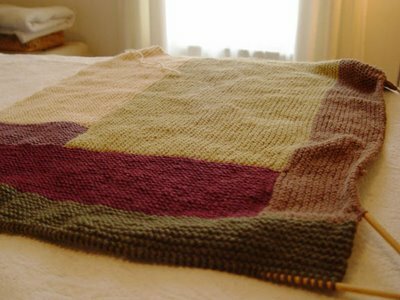 When working the Rows 1 and 2 to achieve the mitered corners for the Nine Patch, on the next to last row before you end up having the final three stitches left on the needle, will that row begin simply with the SSK? I've finished two corners now and both times right before the last row I end up with two stitches on the needle before the marker. It says for Row 1 to "knit to 2 stitches before the marker" but since there are only two stitches there, am I corrct to just do the SSK before the marker? I learned a lot about felting on this project - mostly that size 10.5 needles on double strand bulky is way, way too small. In fact, a correction has been made to the pattern. It now calls for 15s. I think that might have made the felting easier. Nonetheless, they did eventually felt and they are a lot of fun to make. 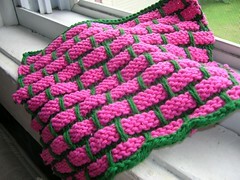 I may try another set in bright pinks and purples for my 4-year-old. Usually, everyone's posts are so full of cuteness and I hate to bring the mood down a few notches (well, quite a bit actually) but my blanket has been stalled for a few weeks. Hopefully this week I'll be able to pick it back up again. So why is it drying in the photo above? It's true! I lived in a room this summer that turned out to be full of mold! Of course I didn't find this out until after I was moving and my yarn stash and WIPS had ALL been exposed. It's been quite the trial. You can read about the extent of the problem here on my blog and the solution here. Hopefully I'll eventually post a finished blanket. Hopefully. Can anyone recommend an online source for Euroflax linen? 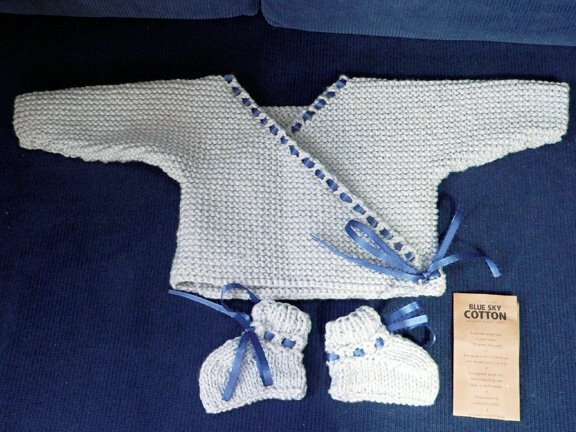 I call it the Mason Dixon Layette. It contains the Heartbreakingly Cute Kimino, the Baby Bib of Love, and the Baby Genius Burp Rag. 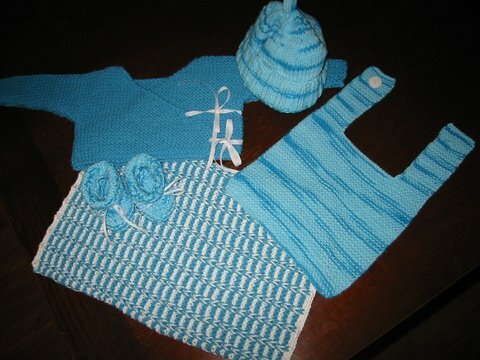 To round out this gift I made booties and a hat. The color of the hat and bib and booties is S&C Swimming Pool. The kimino is S&C Hot Blue, the burp rag is S&C Hot Blue and White. I had never made booties before this or anything like the kimino. I found bits and peices of the Kimino pattern confusing but I understood what it was getting at so it turned out alright. These are for a co-workers new grand baby due in October. It is supposed to be a boy, I like these non-traditional shades of blue as an alternative to true blue or powder blue. I also have a white Asorba Bath Mat on the needles and the other day I bought some Sage and Eggplant Euroflax Linen. Very pretty. I've done the ball band and mason dixon round wash cloths. I can't believe how many patterns I'm making from this book. 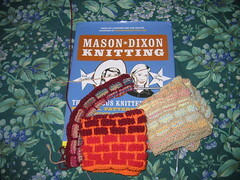 I only learned to knit earlier this year and after looking at other knitting books I have decided that the Mason Dixon book makes knitting seem "accessable". Many of the patterns I look at and think "I can do that!". Plus the the photos in the book are lovely. I have formed a love hate relationship for my Mason Dixion Book and for Kay and Ann who wrote it. Now let me explain. 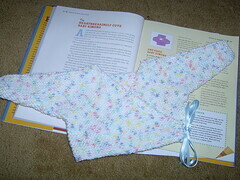 At first I picked up the book and it was ok nothing wonderful but a few patterns that I wouldn't mind making. Then I had my book signed when they came to my LYS, I couldn't be there I was in surgery with my knee. After that I had the chance to meet Ann, who is a wonderful person and I picked up my signed book. At this point I had also purchased the yarn to make the nitie and robe that are in the book. After that I made some dish cloths no big deal or anything. Then I sat down and actually read the book. This was a good/bad idea. 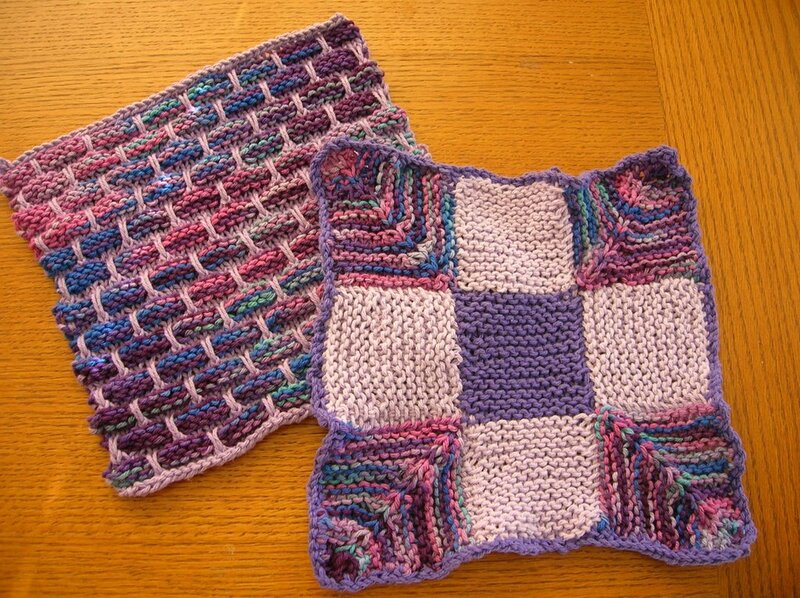 Since then I have made 2 of the bath mats which I love and I have lots of yarn to make more dishrags and other things from the book. Here is where the hate relationship comes in. I want to make at least one of everything in the book!! I am addicted! I love the book! What else can I say! 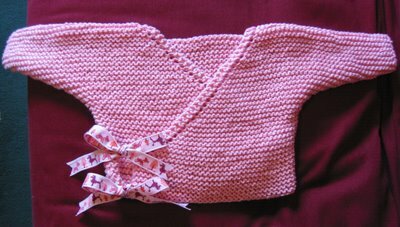 Thanks to Kay and Ann for making such a wonderful book and thanks to everyone for this wonderful knit along to share the addiction with! Hi!. I am new to this blog and I too am addicted to the ballband dishrags. My mom is getting the first one. I am working on number 3. I can't figure out how to do pictures yet so when I do I will post them. I cast on a chevron hand towel while on vacation but didn't get any real work done until I got home. I really like the pink linen (Mer-Lin) but don't really care for the cream (Euroflax) as it is kind of crunchy. I am assuming it is because it is unprocessed and I am hoping it softens in the wash. You'll notice that I mistakenly added two rows to the third repeat, but I didn't notice it until I was too far past it to tink. C'est la vie! 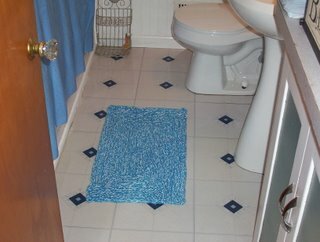 I have decided to make a set of towels for a bride-to-be and am considering buying the Euroflax in a 1/2 lb cones to save some $$. Anyone know how much it takes to make one of the moss grids? I'm trying to figure out how many cones I need. PS see my blog for my first ever contest! I have to admit I am not enjoying working with cotton yarn. 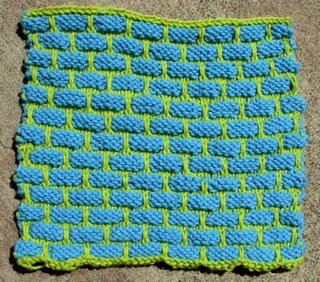 I feel like I am wrestling an alligator whenever I pick up my knitting needles to work on my ballband washcloths for the Mason Dixon SwapCloth. I first thought that it was the bamboo needles that made me loath knitting with cotton, but it seems to be a similar case with using metal needles. 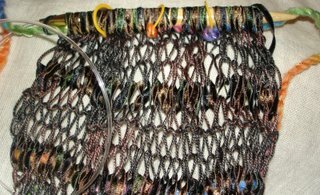 Nevertheless, progress has been made and contrary to the pictured evidence (also on my blog HollYarns), I am almost done with this ballband washrag. Bum deal, my not liking knitting with cotton because I was really thinking I would love to make a cotton blanket for my bed using some sort of cotton--maybe something denim-ish like Rowan's Denim. I don't know if this will make sense to anybody besides myself, but I like the weight of the cotton washcloths and it seems to me that an entire sleeping blanket made of cotton would just be perfectly weighty. So my question is how do you join color B in on line 3?? 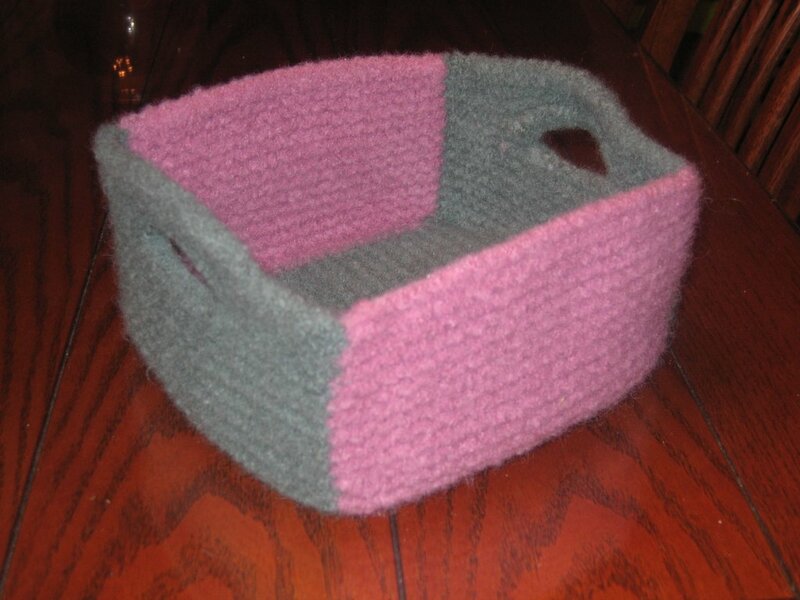 After that it should be in there and just running up the side and twisted to carry it up the side I guess but I am not sure how you join it to start with since I have never knit with more than one color. Thanks to anyone that can help me. 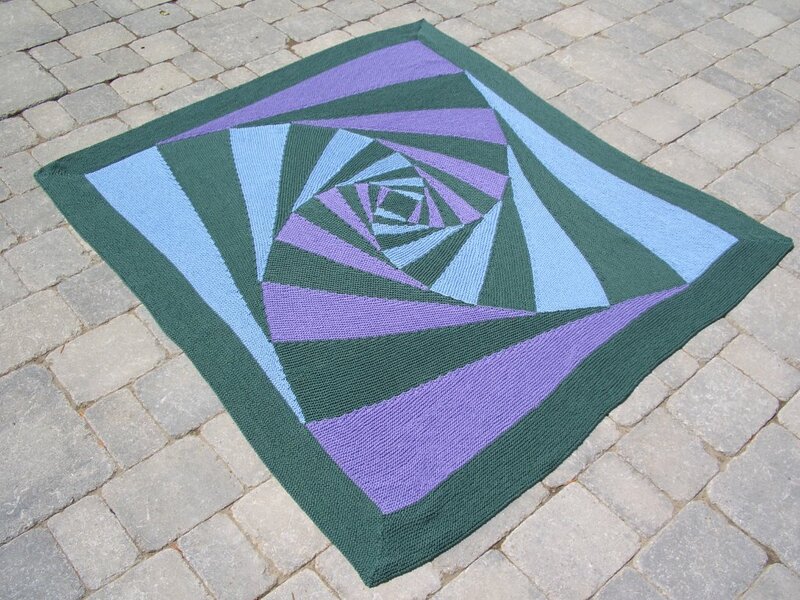 Remember my Curve of Pursuit Blanket? as you know there is a picture of this blanket (not mine) in the Mason Dixon book, but no pattern. I started my Heartbreakingly cute Kimono last night & am about 3/4 of the way thru! I'm using Bernat handicrafter in "Playtime"
I cheated & sewed one sleeve & front together already because I have no patience & cannot wait to see the finished object LOL! **edited to show my pic---TY for the tip of adding the blog to my flickr!!! Since wool is resists burning, I thought it would be a good choice for pot holders. 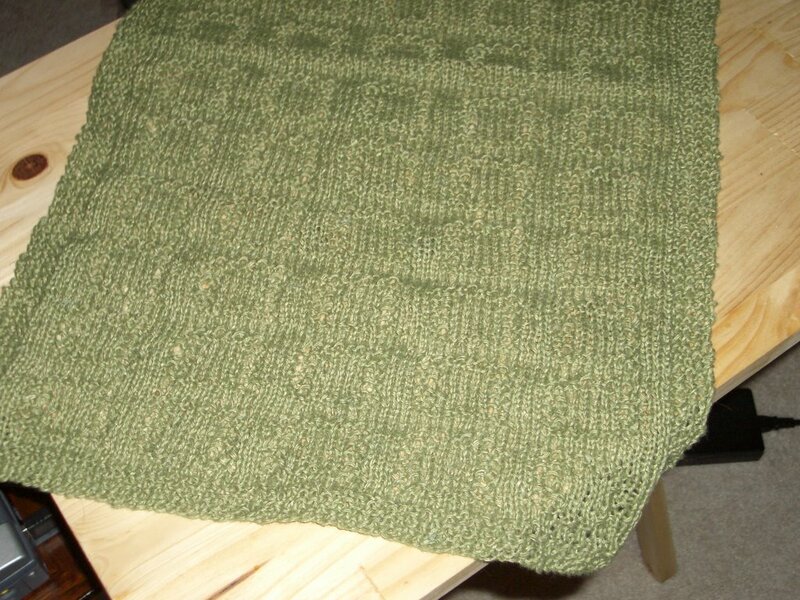 This is the basic mitre square knit with bulky-weight Norwegian wool on #11 needles, felted twice. The loop is 3-stitch I-cord. As Jen points out below, one of the many wonderful things about Mason-Dixon Knitting is the way it encourages us to play with color…in my alternate knitting life, I tend to stick with the neutrals. Anyway, while sorting through the spoils of my latest Sugar and Cream reconnaissance mission for my latest stack o’ Ballbands, I realized I had picked up the color sequence that would enable me to reproduce the Homeland Security Advisory System (OK, I had to go back for the orange). This one goes out to our very own splindarella, who correctly guessed the significance of the color scheme in a mini-contest on my blog. I figure if you gotta go, you might as well go with clean dishes. I'm ashamed to say that I'm having a problem getting started with the Nine Patch dishcloth. The directions for patches 1, 2 and 3 say to knit 12 garter ridges. After the initial cast on, shouldn't I then knit twenty-four rows of garter stitch to get these twelve ridges? I completed the first patch, added on and completed the second, but after I started the third, somehow the first patch looks like it's on the "right" side of the cloth but the third one looks like it's on the wrong side! Can anyone help me? (I don't have access to a digital camera to show my work. ) I feel that I need to have these three patches down correctly or the rest of the cloth will be off. After I add on the second color for the second patch, won't I just be knitting another twenty-four rows, and then the same for the third patch? Thanks to Ann and Kay for inspiring me. And thank you to all the members for sharing, creating, and innovating new ideas. 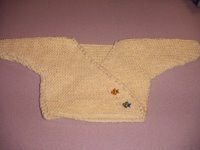 I have thoroughly enjoyed knitting the baby kimono. Having not had a tiny baby in my house for over 29 years, I am not sure of the length. It looks whether short. Maybe next time I will increase the length by an inch. Any thoughts on this with those who have tiny little ones and have tried one of these on? My mom and I used to joke about the very vibrant...almost obnoxious...colors my grandmother would choose for afghans. 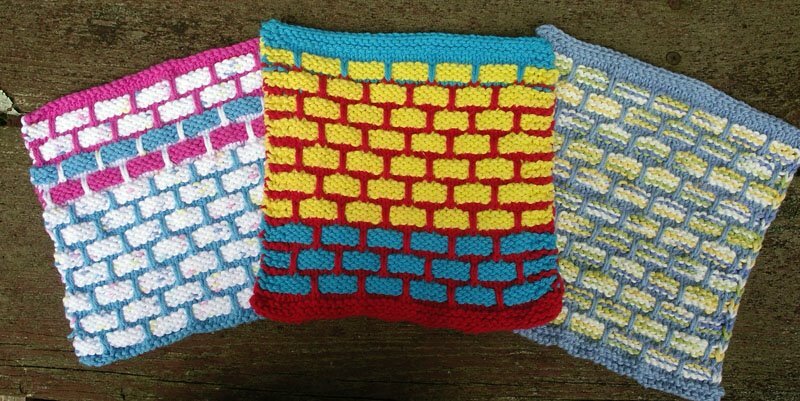 But I look at the set of dishcloths I have wrought for my own kitchen, and I find that I am guilty of the same. The colors bear no relation whatsoever to my kitchen, they were simply fun and attractive. Left to right: the first dishcloth I ever knit in a heretical/non-MDK pattern called "grandmother's favorite", the first ballband I attempted, and my first nine patch learning experience. 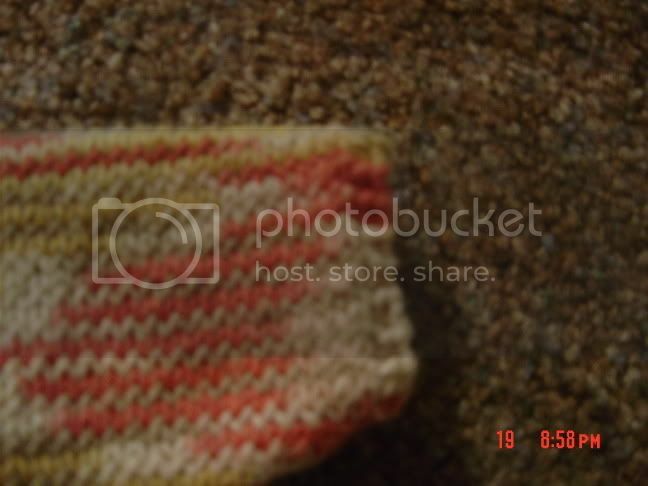 More glamour shots of knitting available on my sporadically updated blog.